Occasional flooding is almost a way of life in Houston. Yet flooding is not a new problem for the city. Harris County suffered through several major floods in its early years, often turning streets into what looked like raging rivers. The devastating floods of 1929 and 1935 exacted huge tolls on the city. Estimated property damage in 1929 was $1.4 million, an astounding sum at the time. Losses more than doubled in 1935, when seven people were killed and the Port of Houston was crippled for months with docks submerged, the channel clogged with mud and wreckage, and railroad tracks uprooted. Twenty-five blocks of the downtown business district and over one hundred residential blocks were inundated with water. 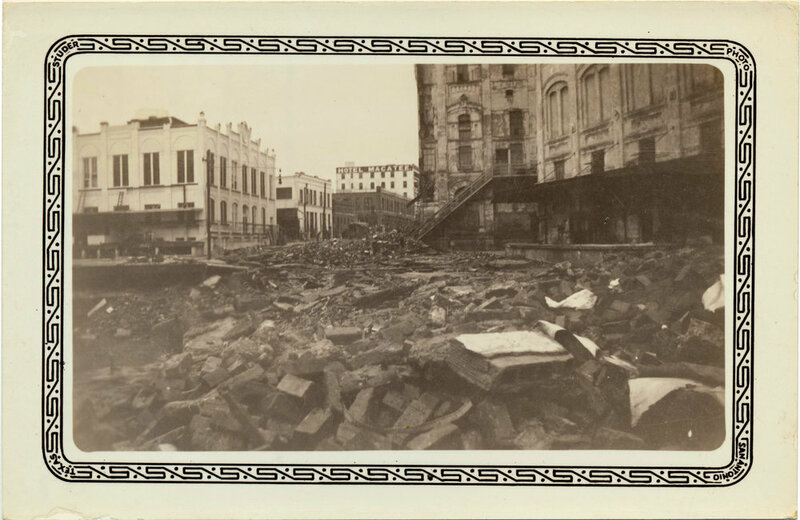 Many businesses rebuilt after the 1929 flood, only to be ruined again in 1935. May 31, 1929-Photo taken from the Capitol Street Bridge. 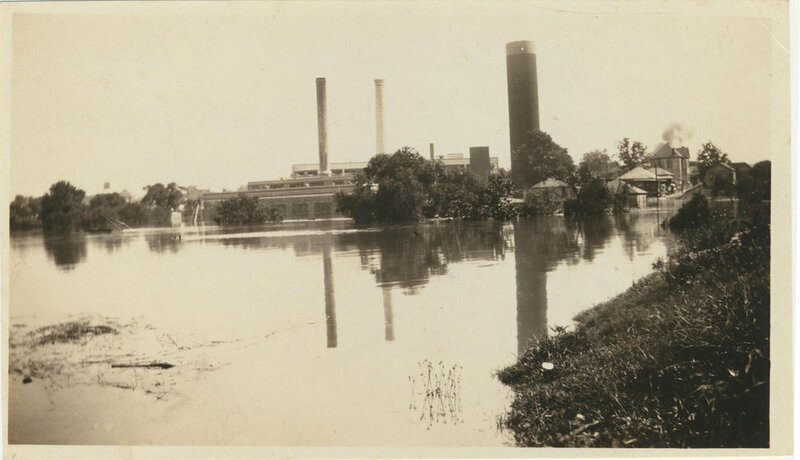 May 31, 1929 flood-this photo illustrates how the waters of buffalo bayou inundated downtown houston. After experiencing these two tremendously destructive floods within just a few years of each other, Houstonians clamored for solutions. A bill was presented to the Texas Congress in 1937 to create the Harris County Flood Control District. The bill was supported by city and county officials, the Houston Ship Channel Navigation District, the Chamber of Commerce and the Buffalo Bayou Property Owners Association. City leaders described the “constant menace of threaten repetition” of overflow of the Bayous as a public emergency that required thoughtful and swift action. December 11, 1935- This photo shows washington Avenue ripped apart by flood waters. To make the argument for the establishment of the Flood Control District, supporters of the bill created a pictorial presentation titled “Wild River.” In it, they illustrated how numerous downtown buildings, such as the US Post Office on Franklin Street, were gutted with their walls ripped away by powerful flood waters. Much like Brennan’s restaurant during Hurricane Ike in 2008, the Yellow Cab Company was ablaze during the flood of 1935, but with the Central Water Plant entirely out of commission, no water was available for firefighting. (or drinking) The building was a total loss. It was this kind of damage to the city and the tragic loss of life that city leaders hoped to prevent. After 1937, the Harris County Flood Control District worked with the United States Army Corps of Engineers to construct two major floodwater detention reservoirs—Barker Reservoir (completed in 1945) and Addicks Reservoir (1948)—as well as hundreds of miles of man-made water channels, but unfortunately, flooding in the city has continued.